We’re always glad to hear when a FantasyLabs user wins money and, well, $1,000,000 isn’t too shabby. Sign up today for FantasyLabs PGA Tools. First, a huge congrats to bidle for an amazing lineup. Being relatively new to daily fantasy sports, other than season-long fantasy football leagues, I could see the value in regards to player trends and news at FantasyLabs. My passion for golf is strong and the Masters is one tournament I watch wire to wire. While browsing for player stats and player news, I came across FantasyLabs. I found the software and player models to be a great resource for everything I was looking for. Shortly thereafter, it was very apparent how important greens in regulation, wind, and driving distance were at the Masters. What worked to my favor was the low ownership of entries on Westwood, who is always a top contender in the majors but rarely wins. He offered good value, and being a Euro brought additional strength if the weather was bad. Speith, like Tiger, was hard to bet against. Paul Casey, another Euro, and Willett were heading into the Masters with some strong play in recent weeks. 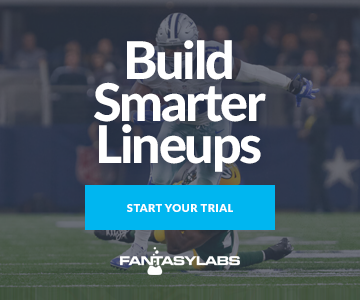 Overall, FantasyLabs is essential for making informative decisions in DFS. One really interesting thing here is that bidle recognized he was successful because of perhaps underutilized Euro players. We feel like FantasyLabs has the best data on many players like that since we have analytics from all tours, not just PGA. We can properly adjust for field strength and course difficulty to put every golfer on an even playing field in a way that other sites – and those who rely solely on Strokes Gained – cannot. Getting Jordan Spieth at less than 10% ownership was key in the Milly Maker, as he was the top golfer in terms of fantasy points, despite his epic meltdown on Sunday and relenting the top spot to Danny Willett. Speaking of Willett, bidle also rostered him. In fact, he had the top-four golfers of the weekend with Willett, Spieth, Lee Westwood (tied with Spieth for second), and Paul Casey (tied for fourth). His worst golfer was Troy Merritt, who struggled in the last two rounds but made the cut, and along with getting Hideki Matsuyama (tied for seventh), that was all he needed along with his stud golfers to take him over the edge. Spieth was low-owned due to recent struggles before the Masters, but had the second-best long term adjusted round score, behind only Jason Day. Matsuyama also had high marks in that regard, along with GIR, which was a key statistic we identified last week in our content and podcasts. Speaking of GIR, Paul Casey is one of the elite golfers in that area — his 72.3% long-term mark is one of the best in the PGA Tour, and thus an interesting, great play last week. And that leads us to bidle’s last great golfer (not to discount the 40 important fantasy points from Merritt, of course), Lee Westwood, who had the third-best recent GIR mark (75.0%) of all golfers entering the Masters. The data on GIR certainly proved to be true last week. 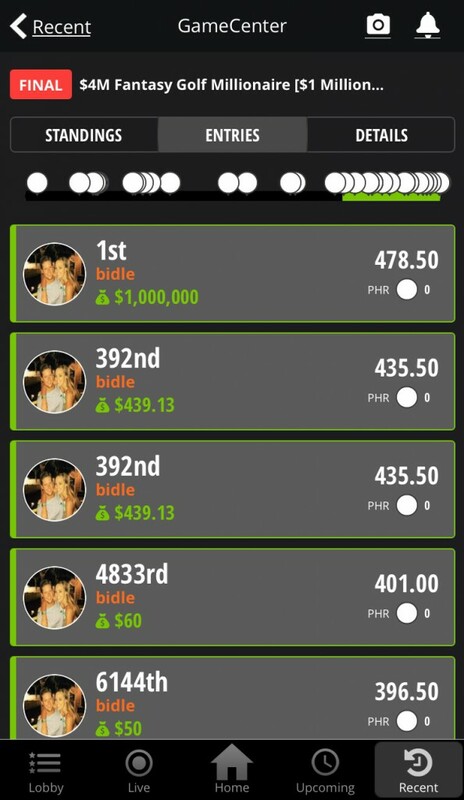 Again, a huge congrats to bidle on taking down the Milly Maker! His players hit a lot of greens, which turned into a ton of green for him (I’m sorry and will end this now). Sign up for FantasyLabs PGA.